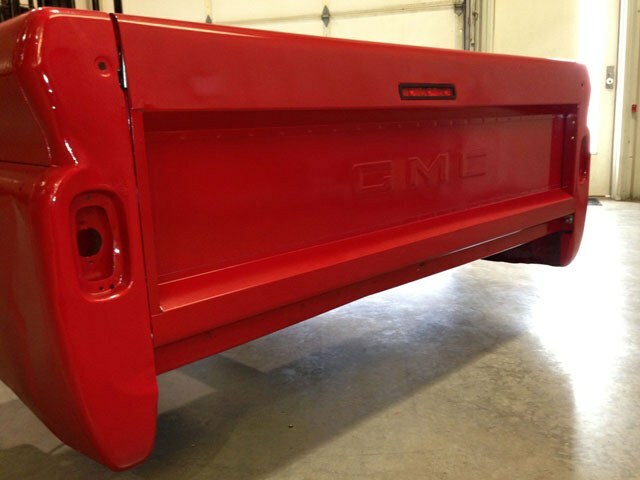 Looking for a cool new tailgate option for your GM 1958-66 Fleetside? Try MAR-K’s Tailgate with Third Brake Light and an inside handle and stainless link! MAR-K now makes tailgates which use a handle - much like the newer fleetside style - to open and close the back of the bed. The handle is inside the bed and offset, so the outside has a clean, custom look with the third brake light in the center. Available in smooth or with GM Licensed CHEVROLET or GMC Scripts. This tailgate is perfect for those who don’t want the tailgate chains, which are noisy and sometimes damage the paint finish. You can choose zinc-plated steel or stainless steel for the link assembly that is included with the tailgate. MAR-K includes the other parts you need to convert your current bed sides to work with the latching mechanism and links. MAR-K Quality Partscarries a wide assortment of restoration and custom parts for GM, Ford, Dodge and custom trucks, full size or mini. For further information, contact MAR-K Quality Parts at 6625 W. Wilshire, Oklahoma City, OK 73132 or call (405) 721-7945, FAX (405) 721-8906 or visit the website at www.mar-k.com.